Credit: 358112Chris Trotman/Getty Images. 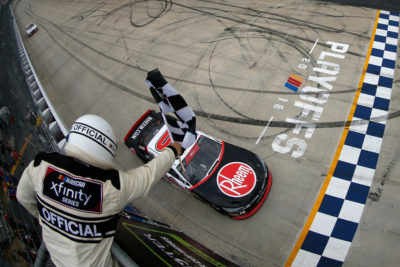 DOVER, DE – OCTOBER 06: Christopher Bell, driver of the #20 Rheem Toyota, takes the checkered flag to win the NASCAR Xfinity Series Bar Harbor 200 presented by Sea Watch International at Dover International Speedway on October 6, 2018 in Dover, Delaware. 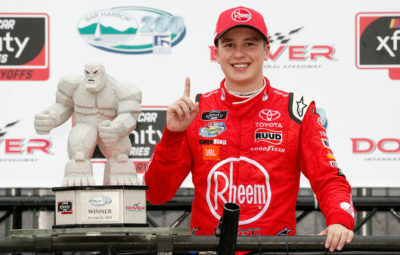 Starting from 2nd Place Car 20 Christopher Bell Rheem Toyota won the 33rd Annual Bar Harbor “200” presented by Sea Watch International, his 6th win in 37 XFINITY Series races. This is his 6th win & 19th Top 10 finish in 2018 and seventh Xfinity Series win. This is his 1st win & 2nd Top 10 finish in 2 races at Dover International Speedway. Christopher Bell was the highest finishing rookie. 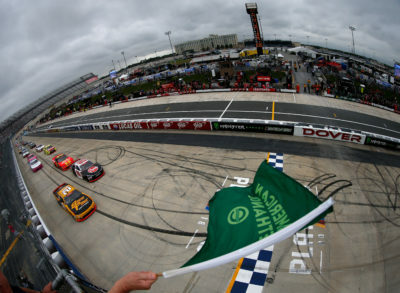 finish in 16 races at Dover International Speedway. Credit: 358116Brian Lawdermilk/Getty Images. DOVER, DE – OCTOBER 06: Christopher Bell, driver of the #20 Rheem Toyota, poses with the trophy in Victory Lane after winning the NASCAR Xfinity Series Bar Harbor 200 presented by Sea Watch International at Dover International Speedway on October 6, 2018 in Dover, Delaware. started from 8th place followed by 9th place Car 42 John Hunter Nemechek Chevrolet Accessories Chevrolet, started from 12th place. Lastly in the Top 10 was Car 11 Ryan Truex LeafFilter Gutter Protection Chevrolet, in 10th place, started from 19th place. Canadian Car 36 Alex Labbe stickystuff.com/James Carter Attorney Chevrolet finished in 21st place. Credit: 358106Chris Trotman/Getty Images. DOVER, DE – OCTOBER 06: Daniel Hemric, driver of the #21 South Point Hotel & Casino Chevrolet, and Christopher Bell, driver of the #20 Rheem Toyota, take the green flag to start the NASCAR Xfinity Series Bar Harbor 200 presented by Sea Watch International at Dover International Speedway on October 6, 2018 in Dover, Delaware. The race had 4 Cautions for 23 Laps: 1st Caution on lap 47 for Stage 1 Conclusion. 2nd Caution on lap 92 for Stage 2 Conclusion. 3rd Caution on lap 163 for #45 Crash in Turn 4. 4th Caution on lap 180 for #60,4,2 Crash Turn 4.
Credit: 358108Jared C. Tilton/Getty Images. 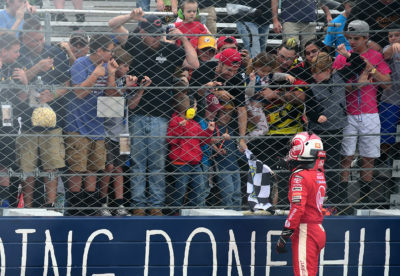 DOVER, DE – OCTOBER 06: Christopher Bell, driver of the #20 Rheem Toyota, hands the checkered flag to a fan after winning the NASCAR Xfinity Series Bar arbor 200 presented by Sea Watch International at Dover International Speedway on October 6, 2018 in Dover, Delaware. 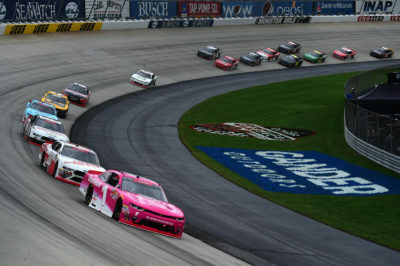 The race had 10 Lead Changes among 6 drivers; D. Hemric (P) 0; C. Bell # (P) 1-47; D. Hemric (P) 48-51; J. Allgaier (P) 52-74; D. Hemric (P) 75-93; S. Gallagher 94-95; C. Custer (P) 96-132; C. Bell # (P) 133-166; C. Custer (P) 167; B. Jones (P) 168-171; C. Bell # (P) 172-200.
Credit: 358109Jared C. Tilton/Getty Images. DOVER, DE – OCTOBER 06: Elliott Sadler, driver of the #1 OneMain Financial Chevrolet, leads a pack of cars during the NASCAR Xfinity Series Bar Harbor 200 presented by Sea Watch International at Dover International Speedway on October 6, 2018 in Dover, Delaware. Race Comments: Prior to the start of the race, the following cars dropped to the rear of the field under penalty for the reasons indicated: Nos. 74 (engine change), 01, 15 (unapproved adjustments). Failed to Qualify: None. Caution Flags: 4 for 23 laps Lead Changes: 10 among 6 drivers. Duralast GT Brakes ?Brake in the Race Award? – Stage 1: John Hunter Nemechek, #8 Stage 1. Duralast GT Brakes ?Brake in the Race Award? – Stage 2: Stewart Friesen, #52 Stage 2 Mahle Clevite Engine Builder of the Race: Ilmor Engines (IE), #51, Mobil 1 Driver of the Race: Noah Gragson, #18. 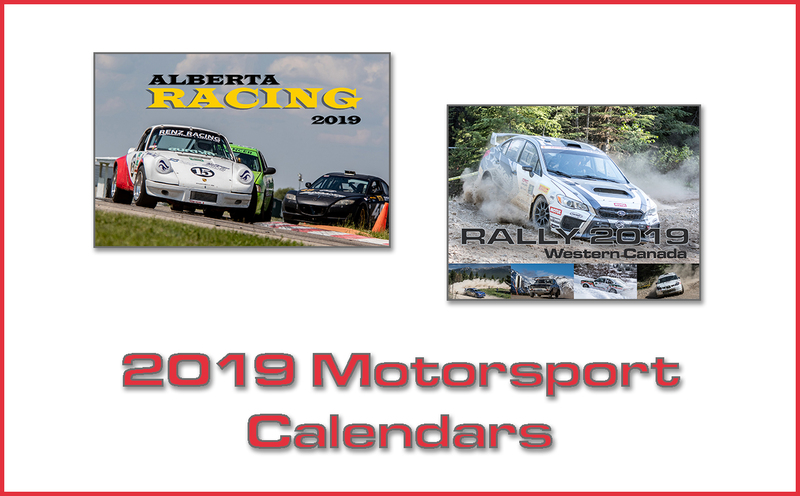 Central Alberta Raceways 2019 Event Schedule! Copyright © 2019 VelocityMotorsportsNews.com. All Rights Reserved. The Magazine Basic Theme by bavotasan.com.